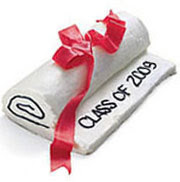 With another school year drawing to a close, you’ll want to make sure your young graduate gets his just desserts — such as a jelly roll diploma wrapped in a fruit leather bow. 1. Heat the oven to 375 degrees. Line a 15- x 10-inch jelly roll pan with waxed paper and grease the paper well. 2. In a bowl, beat the eggs and egg white with an electric mixer on high speed for 5 minutes. Add 1 teaspoon of the vanilla extract, then gradually beat in the sugar at low speed. Stir in the dry ingredients until well mixed. 3. Pour the batter into the pan and bake for 12 minutes, or until a toothpick inserted into the center comes out clean. 4. Invert the hot cake onto a clean towel sprinkled with confectioners’ sugar; remove the waxed paper. 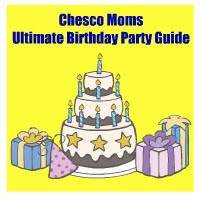 Trim the cake edges with a sharp knife (adults only) and roll up the hot cake and towel from a narrow end. Let it cool on a wire rack. 5. Unroll the cooled cake, remove the towel, and spread on jelly, leaving a 2-inch strip at one end plain. Reroll the jelly-covered portion of the cake. 6. In a bowl, beat together the cream cheese, butter, confectioners’ sugar, and the last 1/2 teaspoon of vanilla extract and use to frost the cake. 7. Use decorator’s gel to pipe “roll lines” on the cake ends and the class year or your child’s name onto the unrolled portion. Finally, add a fruit leather bow.